After Saddam Hussein Al-tikriti seizure of power and the removal of his predecessor, Ahmed Hassan Albaker in June 17th, 1979, intensive pressure and hardship of the regime against Iraqis have been increased, especially against the hawza scholars in Najaf. His eminence decided to stay in the hawza and not leave the country and tolerate the mentioned pressures and dangers to contribute to the maintenance of this scientific and cultural entity and at the same time not to grant the government its wish in evacuating the hawza from its scholars in a step to control it. It was natural that he pressured the scholars of the hawza to participate in this conference; he paid special attention to the Alhakeem family because of its respected scientific and public rank inside and outside Iraq. This intensive pressure has been in different ways of threats and intimidation. When the family refuses to participate, two weeks after the end of the mentioned conference, Saddam - the dictator ordered an arrest to the family as an act of revenge to their noble position which became a milestone in the history of modern Iraq especially when there was no clear religious scientific entity to the Arabic hawza in Iraq at that time. It was his eminence and his father, Ayatollah Sayyid Mohamed Ali Alhakeem (may Allah prolong his life); his brothers and their children were among the detainees. The attention was centered in the interrogations that Alhakeem family faced in the general directorate of security on a group of them, one of them was his eminence himself but almighty Allah mercifully saved him from the evil of the oppressors. 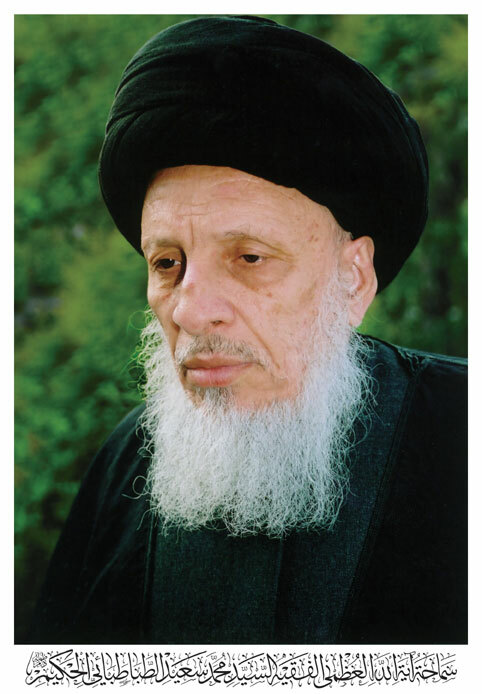 His eminence was known for his interest in teaching and writing since the early time of his youth, after the death of ayatollah Sayyid al-khoie (may Allah have mercy on his soul), many people started to follow him in imitation. Lots of believers and hawza clergymen from inside and outside Iraq including some leading scholars and religious authorities – Marji’s were insisting on his eminence to announce his religious leadership. So he assumed the responsibility in a critical and complex circumstances experienced by believers in various parts of the globe.